Ken Foster didn’t start out as a dog person. Well into adulthood, he seemed aware of the human-canine bond only as a matter of puzzlement. Then Brando happened to him. His new book, The Dogs Who Found Me, is Brando’s story too. There is also Zephyr and Sula. There is Rocco, Sinatra, Biloxi, and Valentino: a great cast of characters. Now he is shamelessly pro-dog. He attributes logic, reasoning, a solid grasp of the modern world, and several frontal lobe functions to dogs. Dog people all do that. And we don’t care that ordinary people don’t believe us. In fact, some of us are rather smug about what we know that they don’t. Foster is not one of the smug ones though. He is matter-of-fact, sometimes angry, always open-hearted, and often full of wonder. The Dogs Who Found Me is part memoir, a look at the amazing bad luck that seems to hound Ken Foster. His heart slowed down to almost stopping one day and he had to have emergency pacemaker surgery. He lived in lower Manhattan on Sept 11. He moved to New Orleans in the summer of ‘05. And, along the way, he got into the habit of rescuing stray pit bulls. Especially ones with major health problems, like heartworms or an eye falling out from a fight. This is part how-to book too; how to interpret dog behavior, how to escape a hurricane with three large dogs, how to let go of a rescue dog you have fallen in love with. There are sections on the wide array of rescuers, how rescue groups work, and why you should always try to rescue a stray dog, even if, as in Foster’s case, it means inviting a stray pit bull to hop into your van while you’re on vacation. There are people who like dogs, there are dog lovers, and then there are dog people. The Dogs Who Found Me is a book about dog people. But at the core of it, this is a book about living a decent life, and taking care along the way. You don’t have to rescue stray put bulls to know how important that is. It’s a dog-gone metaphor. Okay. I admit it. I’m an unabashed dog nut. If you’re anything like me, there are very few things that give you as much visceral enjoyment in the “life’s simple pleasures” department as the sight of a dog with his head and muzzle thrust exuberantly skyward out of a car window with pure joy and reckless abandon---ears, lips, tongue amd drool flapping and slapping in the wind. There’s even a TV commercial for a car insurance company set to an infectious slow, lazy whistling soundtrack with no visuals other than dogs riding in cars. When I hear that music, I drop everything and run to stand in front of the TV absolutely delighted with the parade of dogs riding through my living room in cars. I never get tired of watching it. Never. Hailed as a "master portraitist" by the AKC Gazette, Mark Asher has earned wags and woofs from animal lovers worldwide. He is the author of Andrews McMeel Publishing's Barking Up the Family Tree, as well as Old Friends: Great Dogs on the Good Life. Mark runs a pet portraiture company in Oregon, where he lives with his lively four-legged sidekick, Payton. Asher says, “It has always brought a big smile to my face when I'm going about my day and I turn and see a dog behind the steering wheel of a car, waiting for his or her owner to return. Just that split second when your mind expects to see a human being and instead there is an incredible dog sitting there with a great expression”. 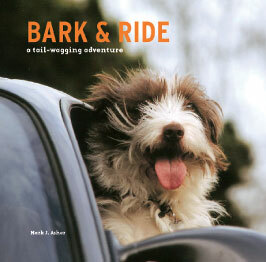 Bark and Ride is full of Asher’s wonderful, colorful visuals of dogs---in, on and around cars. It’s a great addition to any coffee table book collection and a perfect gift for the dog nut in your life.